Looks like a million,” aptly describes the million-dollar makeover of TAIL LIGHTS completed in late 2016. 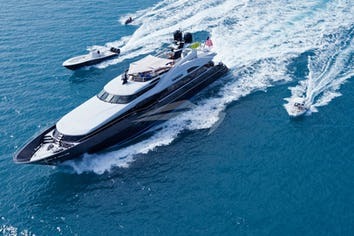 Recently revitalized beyond her original beauty, this luxurious super yacht gleams from the tip of her two-tone, gray metallic Stoppani hull to her splendid, streamlined stern. Step inside the well-appointed interior to her elegant main salon dressed in silk fabrics and fine art; adjacent formal dining for 10, and abundant staterooms below accommodating up to 10 guests. While there is a bonus on deck media room forward which converts to a private cabin with en suite bathroom. 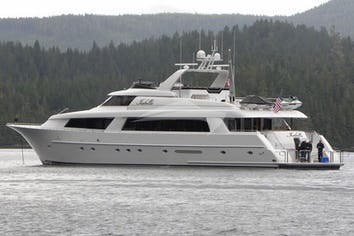 Aloft, she boasts an impressive fly bridge, the place to be for entertaining with a full wet bar, alfresco dining option and full size jacuzzi looking aft with magnificent views, stylishly outfitted with new teak deck furnishings and taupe fabrics. She features plenty of outdoor lounging with al fresco options from the flybridge and aft deck, and relaxation area on the bow's sunpad area with settee arrangement. -Owner's private master suite is fully separate with a private stair case leading below amidships with King size bed, sitting chairs, small self service bar, and safe. The large en suite bathroom has bathtub and separate jet rain shower, double sinks. 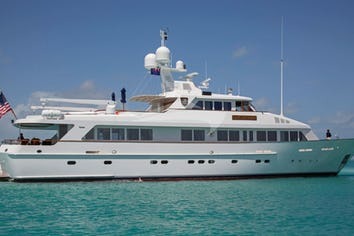 -On the main deck there is a media room forward which has a convertible sofa bed (double) and a day head just opposite with with jet shower which closes off to make a private cabin. There is an additional day head on the main deck. The spacious, well -equipped fly bridge is where all of the fun takes place and is ideal for entertaining and outdoor enjoyment with large Jacuzzi on deck, marble top wet bar/TV and 3 bar stools, comfortable al fresco dining seats up to 10 with extendable teak table and c-shaped dining sofa. , New Murray teak chaise loungers aft of the Jacuzzi. Tail Lights is continuously maintained with regular maintenance periods. Fully staffed with a professional crew of six including your very own gourmet chef.